This ancient and large temple at the foot of the hill is the third Padai-Vîdu celebrated in song, classics, legend and tradition since antiquity. The official name of the shrine is Kulandai Vēlālyudhaswāmi Temple; Tiru Avinankudi is the name of the place. A sacred tank is attached to the temple. Tiru Avinankudi is among the earliest abodes of Muruga and perhaps it had humble beginnings under the shade of the nelli tree (amla). Poet Nakkirar says that God Muruga holds at Tiru Avinankudi a Royal Court of all gods with saints emancipated and clad in saffron-dyed clothes and deer skin. The presiding deity is Muruga as a child sitting on a peacock. A convenient and full view can be taken by the worshippers since the sanctum is on an elevation. He is like a kindly monarch on His throne who receives the humble tributes and petitions of His loyal subjects. The festival deity and the nelli and nagalinga flora and the shrine of Arunagirināthar are worth your notice. The temple was renovated lavishly between 1898 and 1910 by N. M. Subramanian Chettiar of Karaikudi and K.P.S. Palaniappa Chettiar of Kandanur. S.P. Ramanathan Chettiar and other members of the first donor's family have added in 1968 a majestic rāja gopuram—one of Palani's landmarks visible from the hill-temple. Since the late 1970's, a few small shrines and an artistic mandapam have been constructed, adding to the beauty of an already beautiful temple. 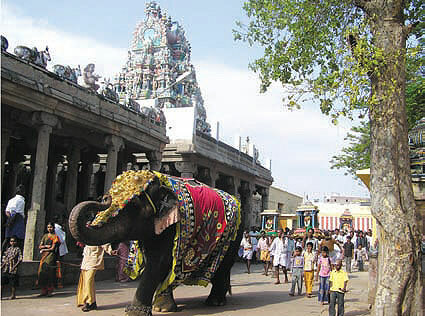 Usually before going to the main hill temple, devotees visit Tiru Avinankudi. It is located near 'Saravana Poigai' sacred temple tank. This is an ancient temple, more ancient than the hill temple and among the earliest abodes of Lord Muruga.  It is revered as the third Padai-Veedu. The official name of the shrine is Kulandai Velayudhaswami Temple and Tiru Avinankudi is the name of the place. A sacred tank is attached to the temple. 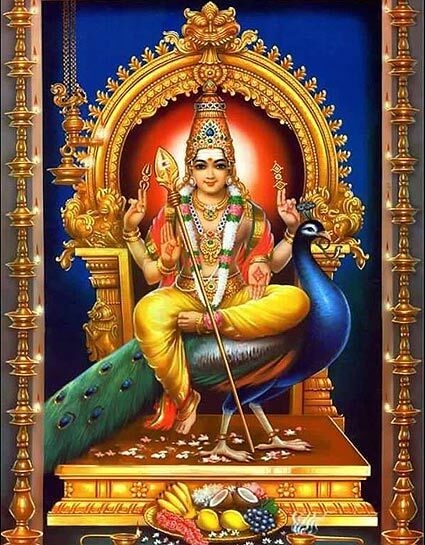 The presiding deity is Muruga as a child sitting on a peacock. A convenient and full view can be taken by the worshippers since the sanctum is on an elevation. He is like a kindly monarch on His throne who receives the humble tributes and petitions of His loyal subjects. 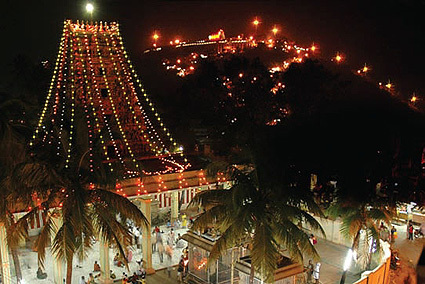 The festival deity and the nelli and nagalinga flora and the shrine of Arunagirinathar are worth seeing.